In March, QUT Media reported that, based on analysis by Professor Chris Eves, “Brisbane’s inner city apartment market will crash in 2016, due to oversupply driven by belief in inexhaustible international demand.” (See Collapse of Brisbane’s inner city apartment market imminent.) This is certainly possible, considering all the apartment building construction in Milton, Newstead, and West End, among other suburbs. 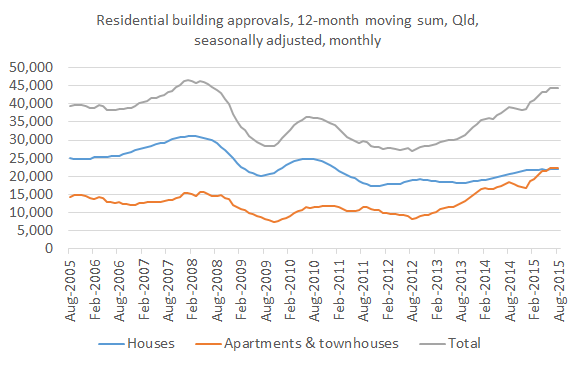 And building approvals over the last twelve months suggest even more supply is expected to come (see chart below plotting the sum of building approvals over the previous 12 months on a monthly basis, based on the latest ABS data). It is extraordinary that unit approvals were at around the same level as approvals of houses over the twelve months to August 2015. This is definitely a market to keep a close eye on. This entry was posted in Housing and tagged apartments, brisbane, buildingapprovals, housing, propertyprices, qld, queensland, qut. Bookmark the permalink. 4 Responses to As many units as houses approved in Queensland in last 12 months – is a unit price crash coming? I certainly believe there are going to be some very disappointed developers, especially those coming on late who will need to discount sale prices. Existing apartment owners will find vacancy rates increasing from what has been a very good run in Brisbane for over a decade and this will be a win for renters. Eventually these apartments will be soaked up but with net interstate migration soft (as you have pointed out before Gene), it’s difficult to see who is going to be living in all these apartments in the short term with so much stock coming onto the market at once. With the lower AUD encouraging more tourism, landlords may need to think about using digital disruptors like Airbnb. Thanks Stephen, great point about Airbnb. Securing development approvals ≠ projects get built. At the moment developers and financiers want 70% pre-sales. If they can’t achieve that, that signals there’s an issue with the market (e.g. oversupply) so they don’t go ahead with construction. The market adjusts itself. However. there’s lots getting built right now so there may be competitive deals out available. Maybe there’s some risk with over-leveraging on the part of buyers but it’s low due to the strictures of borrowing to purchase apartments vs. stand alone dwellings. Thanks Lau, that’s certainly an important consideration, and should restrain to an extent any plunge in prices. Thanks for the comment.